Hunter Johnson Interview with Bruce Duffie . 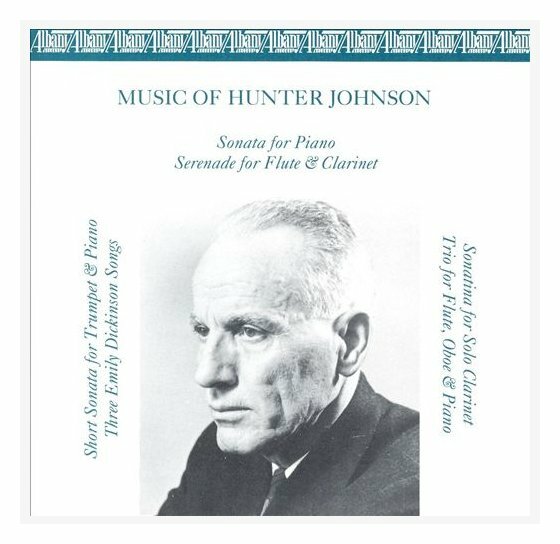 . . . . . .
Hunter Johnson (April 14, 1906 - August 27, 1998) was an American composer. 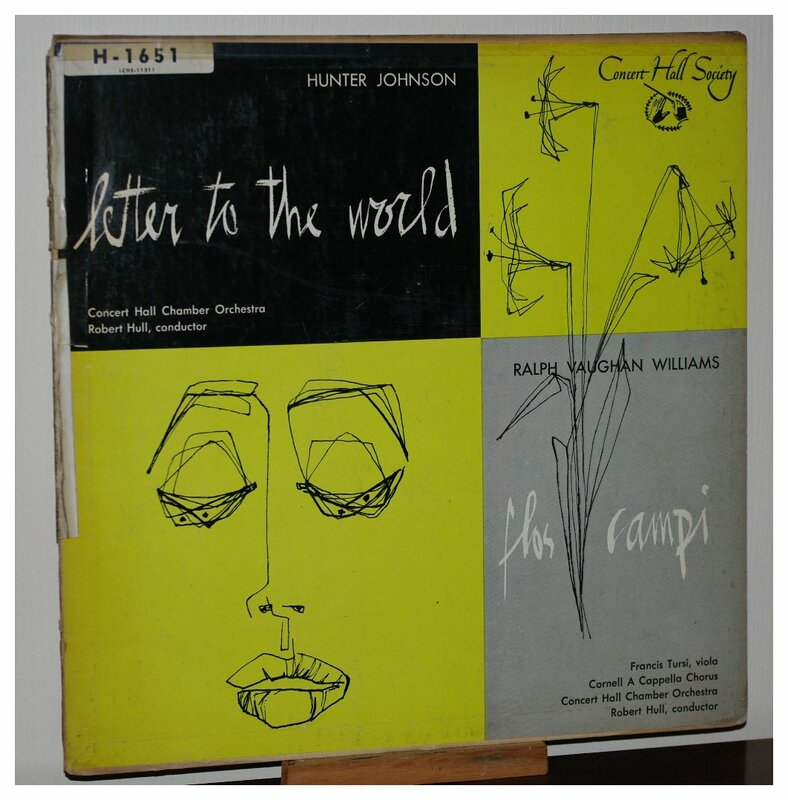 His compositions include a piano sonata and the orchestral music for Martha Graham's ballets Letter to the World, based on the life and poetry of Emily Dickinson, and Deaths and Entrances. His musical style was a combination of neoclassic, neoromantic, and nationalist. Johnson was born near Benson, North Carolina. 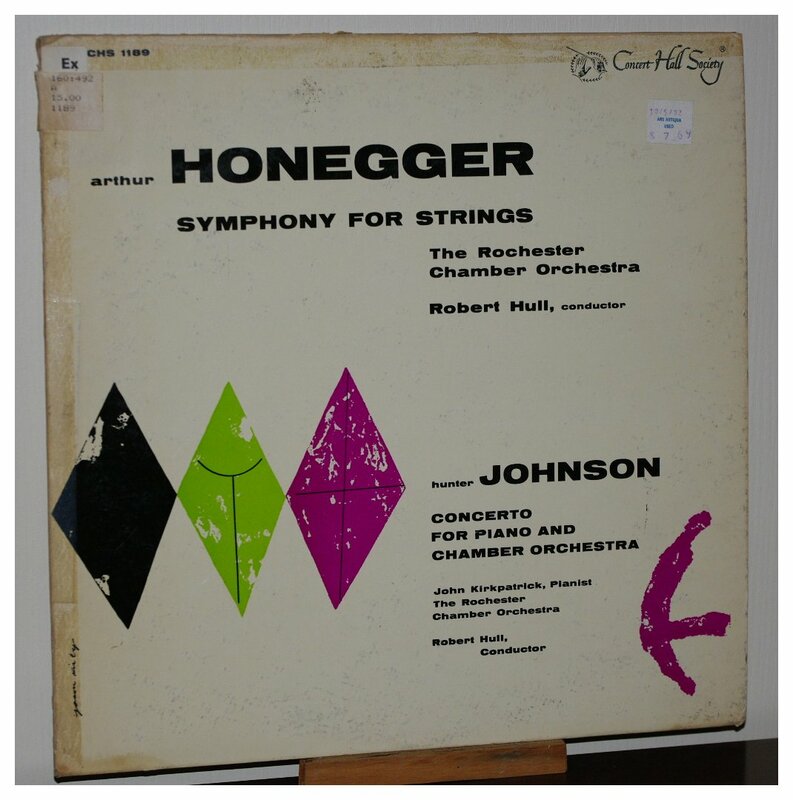 He attended Benson High School and the University of North Carolina at Chapel Hill before leaving the state to finish his undergraduate studies at the Eastman School of Music in 1929. UNC later awarded him an honorary doctorate. He taught at the University of Michigan (1929–33), the University of Manitoba (1944–7), Cornell (1948–53), the University of Illinois (1959–65) and the University of Texas (1966–71). He retired in 1971 and returned to the family farm in Benson. He was the first composer laureate of North Carolina, an award he received in 1991. Most broadcasting stations that do interview segments have not only the on-air talent who are seen or heard, but also support staff that arrange things and set things up and do research and other preparation, as well as engineers to handle the technical requirements. In my situation at WNIB, Classical 97 in Chicago I had none of those luxuries. I was my own support staff and did my own engineering. While this made it more work for me, it also allowed me a great freedom to meet whom I liked and set things up in ways that suited both my guest and me. In gathering material, I sought out musicians that interested me, and sometimes one guest would suggest others, and even provide me with contact information. 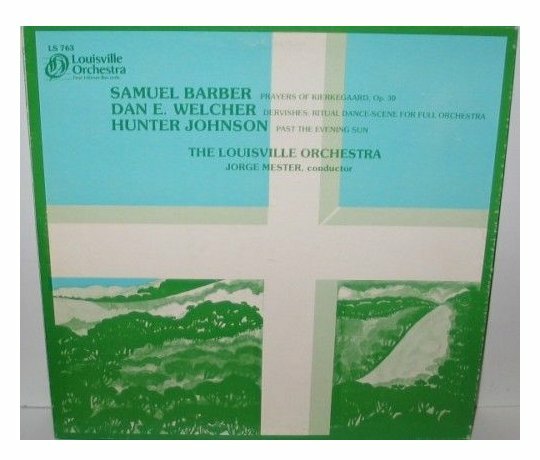 Such was the case with Hunter Johnson. Since the first use of the interview was to be on the radio, Johnson paid me a nice compliment to begin . . . . . . .
Hunter Johnson: You’ve an excellent voice for announcing and giving information. Very sharp, clear voice. Bruce Duffie: Thank you very much. I’m glad I’m able to use it on the air and for doing interviews! HJ: By the way, do you know Ray Salvatore? BD: Yes. He’s the one who gave me your address! BD: I knew Ray many years ago, and then I lost track of him. 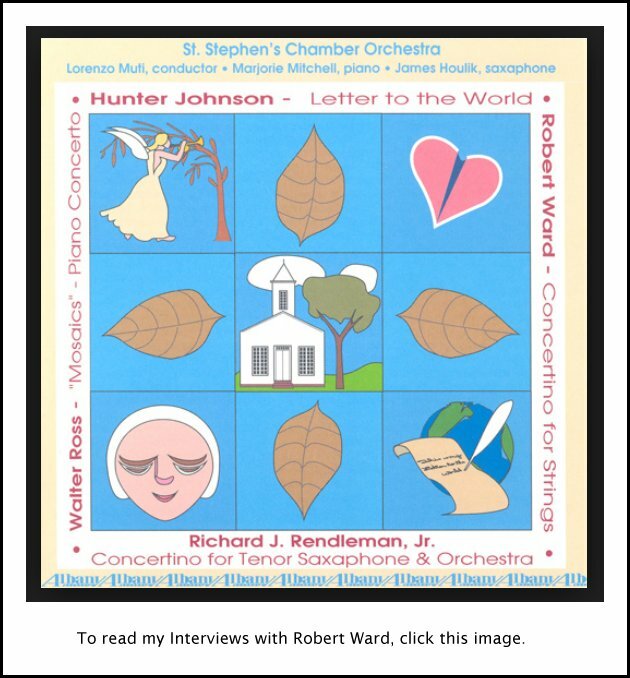 Recently I contacted another composer who’s a friend of his, named Robert Palmer. HJ: Oh, yes, I’ve known Palmer for many years. BD: Palmer suggested to Ray that he call me, not knowing that we were old friends. So Ray got in touch with me a couple of weeks ago or so, and we reacquainted ourselves now that he’s back here in the Chicago area. We were talking about other composers and he mentioned that he had been playing your Sonata, and suggested that if I had not already contacted you for an interview that I should do so right away. So I immediately grabbed the chance because you had been on my hit list for a while. HJ: Oh, yes. Very good. BD: You’ve been teaching music for a number of years. Is it theory or composition, or both? HJ: Theory and composition. I’ve been retired for some time, but while I was teaching I worked with mostly in advanced theory and composition, including graduate students working towards their master’s and doctor’s degree. I taught it at several universities over years — University of Michigan in Ann Arbor, Cornell University, University of Illinois, University of Manitoba up in Winnipeg, and finally the University of Texas. The reason I taught at so many universities was I found I could not mix composition and teaching too well. I just didn’t have that kind of energy, I suppose, and so I would teach a few years and then take off a year or two or three, win a prize perhaps or scholarship, compose for a while and then go back to teaching. I was always fortunate to be able to get a good position, and I enjoyed teaching enormously. In fact I’ve always thought of my career as being a combination of composing and teaching. BD: But you couldn’t do both at the same time because the teaching took too much energy? HJ: When I was in my twenties, I was teaching at the University of Michigan and I could mix the two pretty well. I had loads of energy then, but I threw myself into teaching a little more intensively than many teachers do, and that tends to take up extra energy. But I thoroughly enjoyed teaching. I always thought of myself as a combination of the two even when I was a kid. As a matter of fact, when growing up my great ambition was to be both, to be a creative artist. I wasn’t sure at that time whether it would be as a writer or as a composer, and a college professor! In fact Musical America started off an article about me calling me ‘composer-educator’! BD: Do you approve of that euphemism? BD: We’ll come back to the composition in just a little while, but I want to stick with the teaching for a moment. How did the students change and progress over the many years that you did teach them? HJ: That’s a little bit hard to answer. Some have had success. The various students I had worked in a much simpler idiom than students in later years, and so what they did was easier for them. It’s easier to evaluate. Over the years the approach to music changed, especially 50s and 60s. They thought of music as primarily an experimental thing. Each individual had to be as far out and as absolutely possible, and it proved a problem some times. I never taught electronic music, for example, but I could evaluate it pretty well, and that’s almost a mistake as I don’t think it’s always possible to evaluate anything as new as electronic music, at least not as easy to evaluate as earlier music. But in my later teaching years I had more gifted students. In the earlier years I had a mixture of people who just wanted to take composition because they were interested in it, not having, perhaps, too much time or talent. There were some with a medium amount of talent and some who wanted to become professionals, but in later years my teaching of composition was limited pretty much to singers and graduate students. By that time the weaklings had been weeded out, and so I had very good material to work with, particularly at the University of Illinois and the University of Texas. A considerable number of my students took their doctorates under my supervision, and wrote in a great variety of styles. So my approach to teaching composition is always to nurture what a student has, to let him find his own way and not try to impose my own style on him. It’s difficult some times, especially in the beginning phases to the students’ development, to find out just what is his strongest point it, what he’s driving towards. But in the end I was able to determine that. I was just doing the best I could towards his own goal, and I am happy to say that I don’t think any of my students sounded like me. I never forget the number of students I used to run into who had other teachers, and they all sounded like Hindemith! BD: What did you look for in evaluating the music of your students? HJ: First thing I look for is what I would call a personal profile, a distinct individuality in the music, not just repeating what everybody else was doing. A personal profile, some real individuality was what I was looking for more than anything else, and I had great success in finding that and nurturing that. That approach tends to be a little difficult when you get into the serial area and chance music and that sort of thing. I realize that, but it’s possible to find that kernel, that core of individuality even in more difficult idioms. BD: What else did you look for after you found the individuality? HJ: Productivity and technical countenance, technical ease, ease of writing. I guess that’s about it! BD: You could encourage technique and help to shape their technique, but could you also encourage the inspiration? HJ: Oh, yes! I think so by enthusiasm and praise, particularly when they didn’t know there’s something there that no one else has done. I would point it out to them in the music, and show how to achieve it technically. That they always respond to. BD: Then where is the balance between the inspiration and the technical ability? HJ: That’s a difficult question. By inspiration I don’t mean going off in the blue wild yonder and doing something that has never been heard of before, something that would not communicate, for example. But inspiration is a difficult thing to define anyway. I don’t mean inspiration from on high, but something alive and individual, and with its own personal cast. I’ve never encouraged going off into the wild blue yonder and doing something which is apart from the accepted musical practice. Even with the more advanced sort that does not communicate. That has been one of the great problems in twentieth century music, especially recent twentieth century music, and it was neglected in the academic scenes over the years to a great extent. BD: After giving all that advice to your students, did you follow that advice in your own composition? HJ: It’s very difficult to evaluate oneself in that respect, but I believe so, more or less! BD: Have you been basically pleased with the performances you have heard of your music over the years? HJ: I am not so much displeased as not entirely happy. [Laughs] Even with the best performers, my chief problem has been in the area of tempo. I conduct to get across to the performers the idea that they must follow the indicated metronomic markings. Stravinsky had the same problem. It’s one reason he became a conductor — so that he could play his music at the proper speed. BD: Is the composer the ideal interpreter of his music? HJ: Not necessarily. I found that you put things down in the score, and then do different things when you perform it yourself. Incidentally, the recordings that I’m suggesting I’m not completely happy with were because I was not able, for one reason or another, to be present at any of the recording sessions. The slow sections in all those works tended to be taken rather too slowly. BD: But otherwise, are they pleasing to you? HJ: Quite frankly, I expect in case of most members of the audience a warm response because my music is not written in an avant-garde idiom at all. In fact I’ve made it rather conservative, so I don’t think of it as any of a problem for most audiences, unless they’re really unsophisticated. You’re not going to find them in university communities or the larger cities now. The question of the audience response is one of the biggest problems in recent music. A good many of the composers who have tried to write a very avant-garde type music have forgotten that any language, especially musical language, has to be based in a common experience. That is why a great deal of twentieth century music will probably not last too long because it misuses the language, or rather tries to create a new language that does not have sufficient basis in the common experience. I’m not arguing here for playing folk music or anything as simple as that, but Schoenberg, for example, created a totally new language in my estimation. One person usually cannot do that. It keeps going back to the matter of the common heritage. The greatest of originality in any art is that which takes the common language of that point and advances it. Not too much, but it advances it just far enough to get the result and all of the freshness and individuality and even a bit of strangeness, but not too strange, not too far removed from the common sources of the language. BD: In other words, to make some progress but not scrap it and start anew? HJ: I’m always optimistic because trends now are moving toward establishing more contact with what I call the roots of the musical language. I think that even Rock is going to have some influence on it. I’m not a great devote of Rock, but I think it’s going to have some influence on the serious music of the future. So I feel bound to be optimistic about the future of music. BD: Do you feel that we should try to get the Rock audiences into the concert halls? HJ: Yes. Whether we’d have much success at it I don’t know, but I think it would be a very good idea if they could just absorb some of the greater complexity of language and more interesting aspects of musical language. The basic language the rockers use is still so simple, and unless you’ve got a terrific imagination you don’t then do much with it. You have the thousands of songs, and they tend to be pretty commonplace, you know, boring I feel. There you go! BD: When you’re writing a piece of music, you go over it and touch it up and you work on it. How do you know when you have finished? HJ: I sense when something is not quite right, and when I finally get it right, I know it. I know it inside me and I have no doubt about it. It’s hard to define just what it is, but there’s always that satisfaction then. Usually it’s some technical thing that you’ve worked at. You find some technical thing that doesn’t quite come out right. BD: Do you ever go back and revise scores after they’ve been published? HJ: I don’t know about when they’ve actually been published, but I’ve done a great deal of revision on certain scores. The Piano Sonata, for example, was first written in the 1930s, and then I revised it considerably several years later, in 1948, before it was published. I’d not been completely satisfied with certain aspects of it, practicability and performance, for one thing, and I was able to give it a greater clarity of intent in other portions. I worked it over just before it was published. I spent several months on it in fact. I’m finding I’m happy with it, satisfied with it. It’s worked out very well since. BD: Are you also a performer as well as a composer? HJ: Not really. I am no longer a good pianist, but I was a fairly good pianist at one time when I was teaching. Over the years in general I had to do several performances, but performing never did interest me completely in the end. BD: Did being a performer make you a better composer? HJ: Yes, I think so, particularly for the piano. I can think of composers who were not pianists, and it shows. It does show in the piano works. I won’t give you names, but this is true to a greater extent than composers who write for stringed instruments who do not play those instruments. I don’t know why what should be, but it appears to be. BD: Perhaps it’s because playing the piano is considerably more complicated than playing a violin or a trumpet. HJ: Yes, perhaps that’s it. I would think it would be, yes. BD: What advice do you have for the young composers coming along who want to write pianistically? HJ: Sit and play at the piano a little! [Both laugh] Learn to play a little bit. Get the feel for the instrument. I always think it’s very instructive to point out to them and show them the difference in the approach to the piano and the orchestra. Get some orchestral works and try and do them for the piano. They will find it’s a great exercise in teaching them what is detected on the piano, for example. BD: What advice do you have for the young performers coming along? HJ: Oh, I wouldn’t attempt to give the young performers any advice. I am very happy with most young performers that I’ve heard. I’m glad to see them getting away from the old romanticized interpretations of music. Some would say that many of them tend to be too mechanical in performance, but I don’t feel that. The approach of a pianist like Glenn Gould is thought by some to be too mechanistic, but I don’t. In many of the pieces the method of the music is right. They’re in the notes. You don’t have to over-sentimentalize and do little things for distortions of the tempo and such matters of interpretation. It’s been one of the problems I’ve had with some of the young pianists. They still tend to fall into that old over-romanticized concept of music, which is basically romantic. Inevitably playing a slow section is to over-sentimentalize it, to slow it down and ‘schmaltz’ it up a bit! That seems to be a great temptation. BD: As you look back over the thirty, forty, fifty, sixty years, have the performers gotten better technically? HJ: Oh yes, oh heavens, yes. Much better. BD: If they’ve gotten better technically, have they also gotten better musically? HJ: [Laughs] I wouldn’t make a fat statement about that. They’ve been heading in the right direction, as far as I’m concerned. 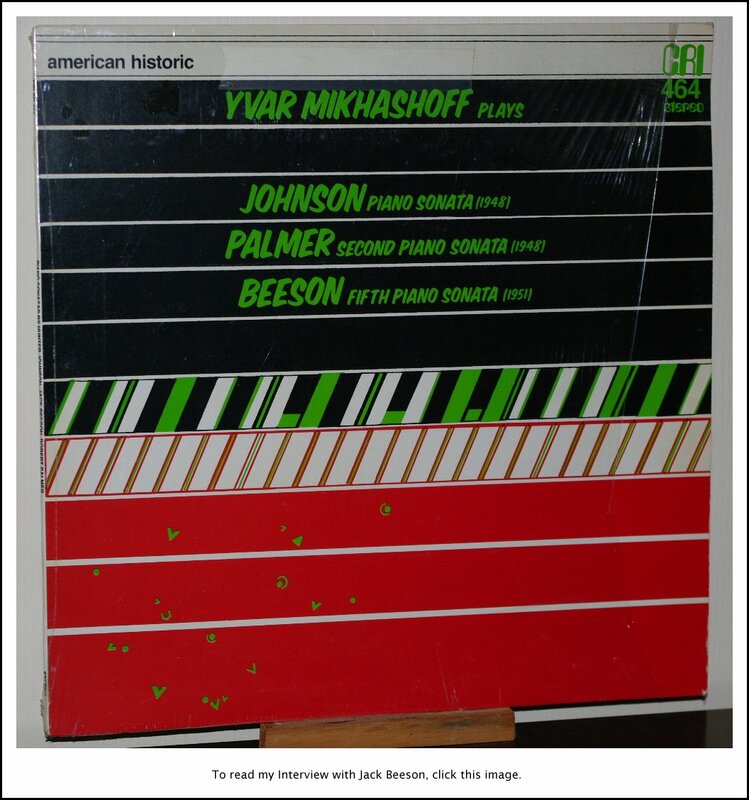 When I hear sometimes the recordings of the older pianists, I am terribly appalled at how inadequate their technique is... people like Paderewski and Rubinstein. BD: Are they just sloppy? HJ: It’s sloppy. They don’t get all the notes and they mess it up with the pedals. There’s too much pedal. That’s one tendency among the new performers that I like — they don’t tend to overuse the pedal as the older ones do. BD: Have you written some music for the voice? HJ: Only a few songs. I have never done a big choral work and I don’t know quite why. I suppose the thought of a large group of singers seems to be an appalling job. BD: Tell me about the joys and sorrows of writing for the human voice. HJ: I never thought of it as involving joys and horrors particularly but just the composing problems. I never did an opera, for example. There one might imagine you’d run into problems. I might mention incidentally that a great portion of my work has been done in the field of ballet. I wrote three ballets for Martha Graham. One in 1940, Letter to the World [revised in 2014 and called At Summer’s Full], and the next one in 1943, Deaths and Entrances, and finally after many years, The Scarlet Letter in 1975. Those first two had hundreds of performances worldwide, and I’m thrilled to be better known for the music I did for Martha Graham than for my other music. It was a happy collaboration, and it was very inspiring to work with her. BD: When she gave you a commission, how much leeway did she allow you? HJ: When I first went to work with her, she wanted me to do the music in a rather mechanical way, with so many bars of 4/4 and so many bars of this and that. I told her, “I can’t work that way. I refuse to work that way, but I’ll work with you if I can work freely. You give me a scenario with the mood, ideas and the approximate length, and I’ll write it. If we have to pare it down a little or extend it, fine.” It was a little difficult for her at first, but she once she got to working that way, she said she wouldn’t work any other way. She said she didn’t know why she didn’t start it that way earlier. BD: Were you ever surprised at the kind of movements that were then used to your music? HJ: Yes, sometimes! [They both laugh] Yes, Miss Graham introduced them to the concept of a counterpoint of music and motion, that doing somewhat unexpected things occasionally in the dance to what one might anticipate, given the nature of the music and the nature of the rhythm, and that works pretty well I think. BD: If you write something specifically for the dance, is it good then to take it into the concert hall without the visual? HJ: No, it isn’t good as a rule. The original ballet Letter to the World was about fifty minutes long, and I did a concert suite which was twenty or twenty-three minutes. Much of the music will not stand too well on its own as concert music. In fact, I recomposed much of the music put into concert suites. I added voices, shortened things in places and expanded others in order to make it work as concert music. Copland I believe did the same thing with Appalachian Spring, for example. BD: Do you feel music in and of itself works well on recordings? Is there a different expectation upon the part of the composer when there is an audience of a couple of thousand in a hall as opposed to an audience of one or two people at home? HJ: I don’t know if I would venture an opinion on that. [Thinks for a moment] As an aside I might say that I enjoy listening to music in recordings about as much as I do in the concert hall. In fact, I often prefer to listen to a good recording than going to a concert because of all the crowds and distractions. But I’ve never been at all opposed to recorded music as contrasted with the live concerts. I’m very enthusiastic about listening to it along or with two or three people. HJ: [Laughs] I could give a rather simple, rather naive answer — to make people happier — but that is inadequate. I think music certainly fills a tremendous need and aspiration in our emotional lives and extends to other aspects, too. It produces an enormous sense of fulfillment for the listener, not just the artists and performers and the composers. It’s almost akin to a religious experience in its ability to give a person a great sense of relief and fulfillment. It enriches one’s life enormously. In fact for me, the artistic experience, the musical experience aesthetically is the ultimate experience, more so than any religious experience without a doubt. BD: You’re in your 81st year. HJ: Yes. I can’t believe it, but I am. BD: What are some of the more surprising things that you have noticed about the direction of music over this length of time? HJ: I can’t say that there is very much that has surprised me, really. The most surprising single thing, actually, was concerning the certain movement in American academic music. 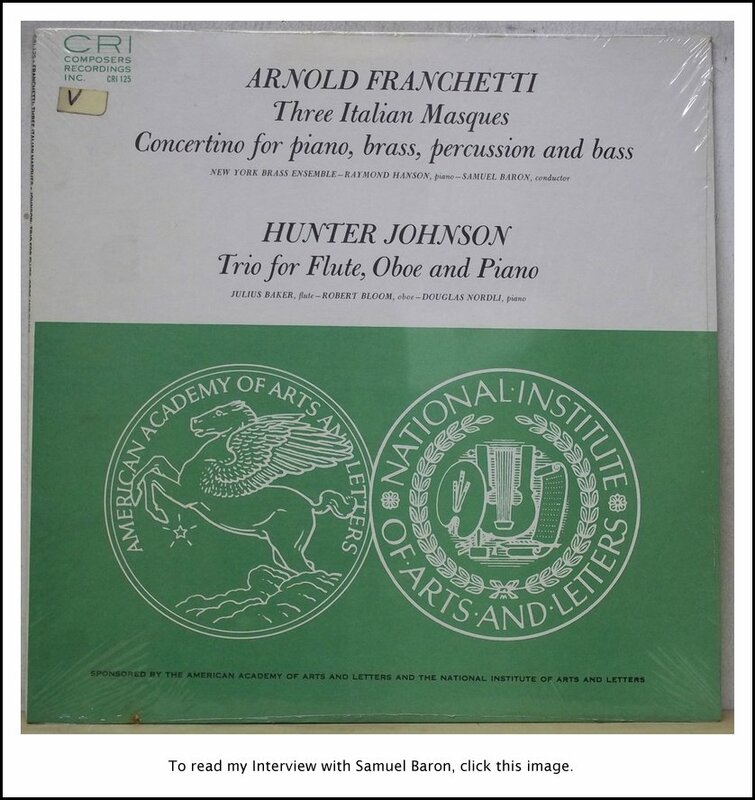 In the 1960s, particularly, in all the academies — I mean that in the general sense, the university and conservatory music departments — all the interest among most of the composition teachers, and certainly the students, was on serialism. They had to write in that particular style, idiom, language, whatever you want to call it, otherwise you were hopelessly old-fashioned. You were outside the pale. By the early 1970s, the thing had collapsed completely. I suppose there are a few students who learned the technique, but very little is being written in serialism. Nearly all my students at one time just wanted to write in the style of Webern; not Schoenberg particularly, but Webern. Its simplicity appeals to them a great deal, and it had a great deal to teach them, so I let them write some things in Webern’s style. BD: Did they also try to imitate his brevity? HJ: I had to work on that with them! [Both have a huge laugh] That is the thing that brought a surprise — the utter collapse of the serial music in America. BD: Are you glad that it’s gone? BD: Is there any hope for these composers? HJ: [Laughs] Oh yes! Things move on regardless of everything, and what it boils down to is when sufficient talents come along, they’ll make these amalgamations and unifications and write just what is needed. I don’t think it’s the sort of thing that can be done by making too much thought about it. Just knowing in itself is not enough. We have certainly by far the most sophisticated composers and artists in every area the world has ever known. They know everything, and they are self-aware. There’s never been an age in which self-awareness was so pronounced. Of course a good artist, a good creator has to be self-aware, but when it is carried too far it tends to stifle the best. Sometimes the really big talents come along, such as Stravinsky and Bartók, and in this country Copland. I have great reservations about much of Ives’s music. I’ve heard people say that he knew exactly what he was doing, and that he placed every note exactly where he intended to place it. Perhaps so, but I have some doubts about that. He is at his best in something like The Unanswered Question. That’s terrific, but at moments in the Fourth Symphony and the Concord Sonata he storms all over the place. [Laughs] Perhaps I shouldn’t be saying all this about other composers! BD: Without naming names, do you feel that there are potential giants coming along? HJ: That I can’t answer because for a decade or so I’ve not really kept up with what’s going on among the young composers. I heard some of the music of Philip Glass. BD: Oh, the ‘minimalist’, yes! HJ: Yes. I like some of his music, but much of it I find very boring. It’s too simplistic, too repetitive, so for me he’s not the kind I’d be looking for. BD: And yet he’s gaining wide acceptance. HJ: Yes, I know. I think that’s because of the top element, and all the hype and the hoopla, and all the spectacular events, and the advertising. That has become such a part of the music scene and of all the art scenes that the person and the hype and the hoopla surrounding the person taken together almost overshadows what the artist has to say. To a certain extent this is not tasteful. HJ: In the past, yes, but not in recent years. I’ve haven’t been an active composer now for the last decade or so. BD: But when you had commissions, how did you decide which ones you would accept and which ones you would decline? HJ: I don’t think I was offered one that I didn’t accept. I’ve always accepted commissions unless there was too much of a limitation on the time they would wish to finish the work. I’d never work under great pressure. BD: [With a gentle nudge] If they wanted a four-movement symphonic work for large orchestra next week, you would say no? HJ: [Laughs] Probably! That would be just impossible for me. I never wrote with the greatest of ease. I just never turned out work one after the other. In fact my total output is not great, and I’ve never considered myself a prolific composer, particularly in view of the fact that I’ve spent so much time teaching. But I always like to feel that I concentrated what I had to say in relatively a few works rather than spreading it out. There’s a tendency for some composers to write too easily and repeat themselves too much. Of course there’s many historical precedents for that. BD: When you were composing, was the act of composing fun? HJ: Oh, yes! It was hard work and it was fun mixed with a certain misery in the nature of frustration more than anything else. It wouldn’t come right for some time, but when it finally came right, and you developed a really fine idea and played it over, you got as glorious a feeling as one could possibly imagine. I read about the Ecstasy of the Saints, and I always said that for me the ultimate in ecstasy was writing a passage that really came off even better than I anticipated. BD: I’m glad you had that opportunity many times. HJ: Yes, so am I.
BD: You say you’ve not been very active in the last ten years. Are you still composing at all? HJ: Not really, not at the present time. I’m dashing round with some material from this ballet, Scarlett Letter. I’m wanting to make a shortish piano suite out of it, but I find that it was orchestrally conceived. It’s difficult to take an orchestral work and try and make a genuine piano piece out of it. Some of it works all right in this case, and some doesn’t. I had hoped to have that finished by now, but I had serious health problems in the spring and I haven’t quite recovered from that yet. So I don’t know what will happen in the future. BD: I hope that you still have many more years of creative life ahead of you. HJ: Well, thank you. I hope so too. It’s a great pleasure for me to respond to your invitation to participate in this series. I hope it works out all right. BD: I’m sure it will. It’s been a great pleasure to chat with you. I’m glad that we were able to make the contact and get together on the phone. This conversation was recorded on the telephone on September 5, 1987. Portions were broadcast on WNIB (along with recordings) six months later, and again in 1991 and 1996. This transcription was made early in 2015, and posted on this website at that time. My thanks to British soprano Una Barry for her help in preparing this website presentation.